Just because Flip left the pocket camcorder business doesn’t mean people don’t want small handheld recorders that shoot high-def video. Sony adds a new twist to the concept with the Bloggie Live model introduced at CES; it has built-in Wi-Fi and allows users to broadcast their video live over the Internet. Bloggie Live weighs a perfectly portable 5 ounces, sporting a 3-inch touch-screen display. 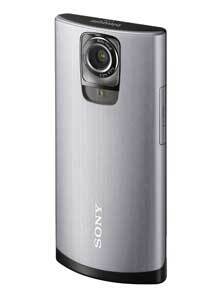 It records full 1080p video along with 12.8 megapixel stills. With 8 megabytes of built-in memory, you can store 75 minutes of high-def video before off-loading to your computer. There’s also a built-in LED light for shooting in low light, and a stereo microphone. Using the Bloggie is point-and-shoot simple – no manual controls to fiddle with, and automatic face detection to keep your subject in focus. The major missing feature is an optical zoom lens – you can use 4x digital zoom, but that always hurts image quality. The design and construction are first-rate. The curved back feels good in your hand, and there’s a flat bottom that lets you stand the camera up on a table for hands-free shooting. The major departure from previous Bloggie models is the addition of Wi-Fi, allowing wireless uploading direct to Facebook and YouTube. If you set up an account with Qik Video (a Skype service), you can even stream live video to friends and family. Streaming video is limited to VGA resolution, but the camcorder stores a full-res copy in memory for uploading later if you choose. Invited viewers can even comment on the video while you stream, and their comments will appear on the Bloggie screen. The Wi-Fi connection also lets you download video files from the Bloggie to your PC or Mac without hunting for a cable (there’s also a flip-out USB connection if that’s more convenient). Bloggie Live is not a cheap purchase at $250, but the convenience and spontaneity of a Wi-Fi connection is certainly an appealing option for sharing your travels with friends and family.